After you launch your API program on Apigee Edge, the operations team is responsible for ensuring that the APIs are available and performing as expected to maintain a seamless experience for your consumers. Proactive detection of API traffic and performance issues is a key component to the team's success. As API traffic increases, without access to in-depth data analysis and contextual alerting, the ability to meet customer service-level agreements (SLAs) may be put at risk. Apigee API Monitoring helps operations teams increase API availability for application developers, customers, and partners. 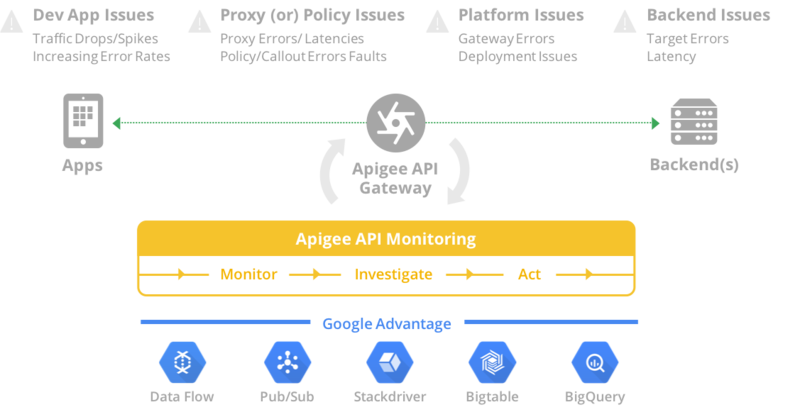 Apigee API Monitoring works in conjunction with Apigee Edge Cloud to provide real-time contextual insights into API performance, helps quickly diagnose issues, and facilitates remedial actions for business continuity. Watch a short video for an overview of Apigee API Monitoring. Increase API availability and reduce the mean-time-to-diagnosis (MTTD) by quickly investigating issues with your APIs. Take appropriate actions based on contextual alerts before consumers are impacted. Leverage Apigee fault codes to speed diagnosis. Isolate problem areas quickly to diagnose error, performance, and latency issues and their source, such as developer apps, API proxies, backend targets, or the API platform. Leverage the best of Google technologies, such as Data Flow, Pub/Sub, Stackdriver, Bigtable, and BigQuery, to compute complex metrics efficiently and at scale. Apigee API Monitoring requires customers to use Apigee Edge Cloud Enterprise and the new Edge UI. Note: Apigee API Monitoring is not supported by the Classic Edge UI or by Edge for Private Cloud. Also, API Monitoring is not support by Edge Microgateway.